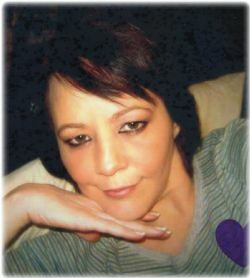 Janice Victoria ''Vickie'' Bunker 48 of Searcy passed away on September 23, 2018. She was born January 25, 1970 to Fred Kidd and Mary Chambers. Vickie enjoyed the outdoors, fishing, cooking, and drawing. Left to cherish her memory is her husband Donald Bunker, her parents, three sons David (Carol) Crutchfield of Searcy, Justin Crutchfield (Ciara) of Rose Bud, and Daniel Crutchfield (Tammy) of Searcy, Five Grandchildren, four sisters Candace (Boris) Willhite of Mcrae, Genetta Kidd of Kensett, Jackie (Duane) Pate of Searcy, and Jana Coker of Kensett, and a host of other family and friends. She was preceded in death by a twin brother Gill Kidd of Higginson, and her grandparents. Funeral Service is at 2:00 PM at Roller- Daniel Funeral Home Chapel, Searcy AR, Wednesday September 26, 2018, with visitation to begin at 1:00 PM. Interment will immediately follow at Kensett Cemetery in Kensett Ar. Click Play below to view the Video Memorial for Janice Victoria Bunker. If you would like to order a DVD copy of the video, please contact the funeral home at 501-268-3546.